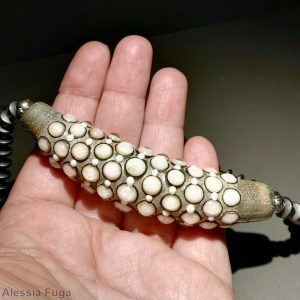 Amazing, unique, one a kind, “Fenice” bead in ivory, turquoise and silvered clear. Although this is a big sized bead, it’s not difficult to wear it as single pendent and it’ very lovely to hold in your hand thanks to its texture. 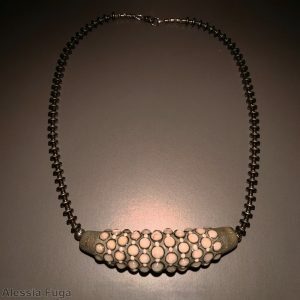 The oxidized 999 silver leaf on the base gives to my “Fenice” beads their characteristic sparkling look. Another interesting thing about this kind of beads is that, exactly like silver,during years, they continue to react with air. All my glass creations are made with Effetre glass and properly kiln annealed to guarantee strenght and durability. Colors may slightly vary on different monitors and in different lighting conditions. Round "Fenice" bead in light and medium topaz. Etched long focal lampwork glass bead in dark transparent grey with fine acid green scroll work.